Create Your Plate: An Easy Way to Eat Well (25/Pkg) is a brochure featuring a two-page layout of the plate method for diabetes meal planning. This is a great resource for newly diagnosed patients or those needing a simple meal planning technique. It can be a real challenge to maintain proper portion control whether you’re at home or on the go. 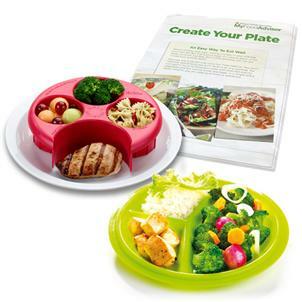 For this reason, we included the 9” Precise Portions Go Healthy Travel Plate with Lid. Whether you’re at home, at the office, or out and about, you can manage your portion sizes using this three-sectioned to-go plate featuring an easy-sealing lid with ventilation control for microwaving. Plate and Lid are BPA-Free, dishwasher-safe, and microwave-safe. Take the guesswork out of healthy portions with this handy meal measurer! The meal measure is a plastic portion control guide that fits right over your plate. Serve yourself or others just the right amount at every meal. Now you can measure your protein, starch, vegetables and fruit for perfect portions. Each cavity of the Meal Measure has a 1-cup and 1/2-cup mark so you can adjust portions for your individual dietary needs. Portion control is an important part of weight management, and this handy plate guide makes it easier than ever. Clean up is also extra easy—the healthy portion Meal Measure is completely dishwasher safe. 8” diameter. I just am signing up and haven't even sent in my order yet. I will rate it when I get it and take a look at the contents. Had to create a rating to create an account. Makes no sense!